This beautiful miniature painting combines so many iconographical aspects, that the viewer can easily follow the connection from the very conception of Christ to his final days in Jerusalem. In the left center of the painting, a fountain of pink marble appears. This rocky font may be a representation of the "Fountain of the Virgin," the only water spring source in the countryside near Jerusalem. Its proximity made it a popular place for drawing water and watering sheep and goats. The artist conflates the countryside of Nazareth, six miles from Jerusalem, with the location of this spring. Jerusalem, the holy city, is therefore represented in the distance. According to tradition, Gabriel announced to Mary her carrying of the Christ child at this spring, hence the name, "Fountain of the Virgin." Limbourg, Jean de, ca. 1385-ca. 1416 ; Limbourg, Paul de, ca. 1385-ca. 1416 ; Limbourg, Herman de, ca. 1385-ca. 1416. 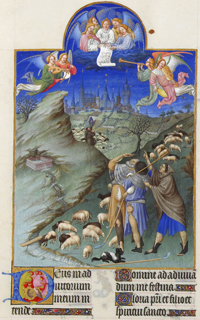 The Annunciation to the Shepherds, Les Tres Riches Heures du duc de Berry, Folio 48r, from Art in the Christian Tradition, a project of the Vanderbilt Divinity Library, Nashville, TN. http://diglib.library.vanderbilt.edu/act-imagelink.pl?RC=54231 [retrieved April 23, 2019]. Original source: http://commons.wikimedia.org/wiki/File:Folio_48r_-_The_Annunciation_to_the_Shepherds.jpg.